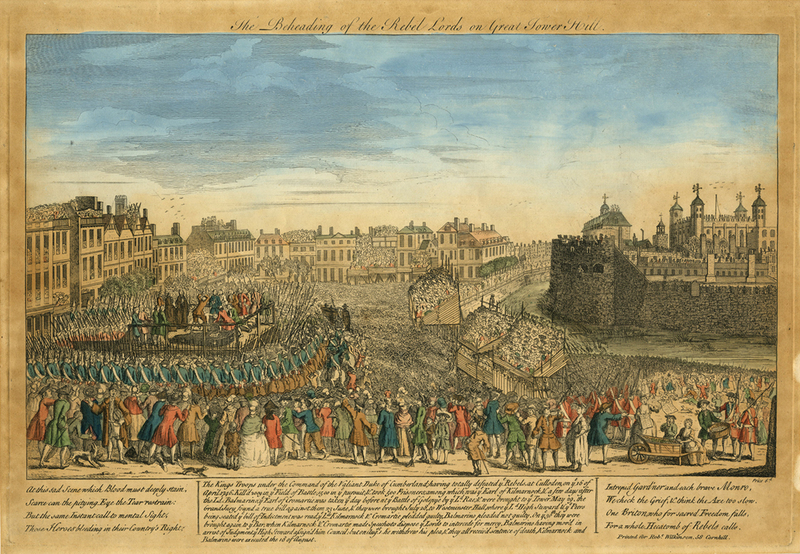 Among the items recently received from the Virginius C. Hall Jacobite Collection in the Archives & Rare Books Library is a watercolor of the “Beheading of the Rebel Lords on Great Tower Hill.” Unfortunately, the image is not one-of-a-kind. It is an incredible work, though. Depicted in this scene is an endless crowd surrounding a scaffold. On the platform, one man has his head down on the chopping block as an ax is raised over his neck. This execution took place in 1746 after the Jacobite Rising in 1745. The rebellion was started by Prince Charles Edward Stuart (Bonnie Prince Charlie) in his attempt to steal back the English throne. Those executed were loyal followers who not only aided him in his attempts to overthrow the government, but were his seconds in command. The Kings Troops under the Command of the Valiant Duke of Cumberland; having totally defeated thee. Rebels at Culloden, on the 16 of April 1746. Kill’d 2009 in the Field of Battle. 1500 in the pursuit & took 500 Prisoners; among which was the Earl of Kilmarnock & a few days after the Ld. Balmarino; the Earl of Cromartie was taken the day before at the Battle of Golspye by the Ld. Rae; & were brought to the Tower May 29. The Grand Jury found a true bill against them 23 June, & and they were brought July 29, to Westminster Hall where the Ld. High Steward and the Peers being seated the bill of indictment was ready, the Lds. Kilmarnock & Cromartie pleaded guilty, Balmarino pleaded not guilty. On the 30th they were brought again to the Bar; when Kilmarnock and Cromartie made speech to dispose the Lords to intercede for mercy, Balmarino having mov’d in arrest of Judgment, the High Steward assign’d him Council; but on August 1, he withdrew his plea, & they all receiv’d sentence of death. Kilmarnock and Balarmino were executed the 18 of August. The Earl of Kilmarnock refers to William Boyd. Balmarino refers to Arthur Elphinstone. The Earl of Cromartie refers to George Mackenzie. He avoided death allegedly because his wife was greatly pregnant at the time. However, he lived a sad life with little freedom, and less wealth. The image was printed for Robert Wilkinson, who we assume to be the artist as well. Wilkinson’s primary job was as a cartographer. There isn’t much evidence of other artworks he may have created.